Over and over again the violence continues and the on-going message that Black Lives Matter less than white lives. The denial of white people that the killings in an Emmanuel AME Church were racially motivated, that the killer was immersed in a culture that taught him that white people are threatened by black people, that black people are taking over, that he must protect white women's purity continues. We became obsessed about a white woman passing for years as African American effectively drowning our awareness of how a white male police officer assaulted a 15 year African American teenager in a bikini for doing what many teenagers do - talking back or not showing the kind of respect he expected. Over and over again we as white people will turn ourselves inside out to deny that systemic racism is real and rampant. The Wall Street Journal has declared that systemic racism simply doesn't exisit anymore. I know that the people of color in our country would say that is news to them. Every day people of color live with the constant threat of violence. Our silence, our refusal to accept that systematic racism is real and is literally killing black people. When will we face our privilege, acknowledge our role and do our part to make what the Wall Street Journal has already declared to be true that systemic racism no longer exists? It is not true yet but we can do our part to make sure it does become a relic of a painful past. 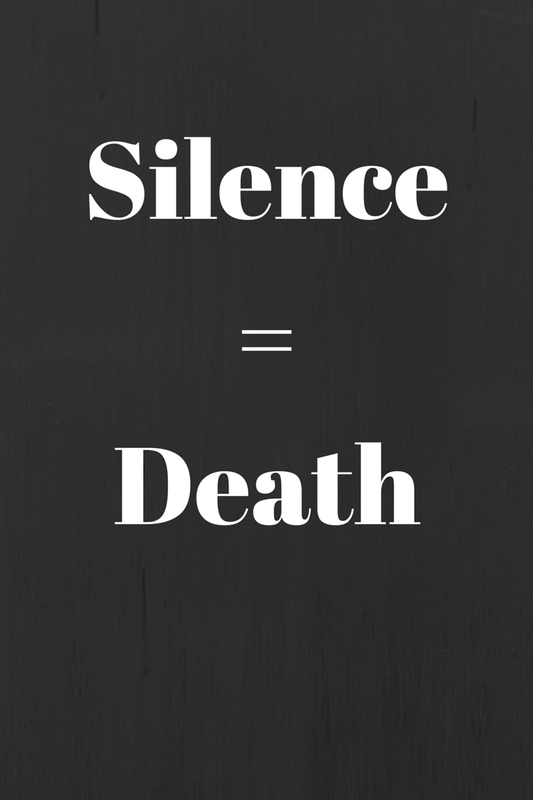 So for this Throwback Thursday post, I share this piece on Silence = Death. I have been struggling to find words to write about the death of Michael Brown, the failure of the Grand Jury to indict Officer Darren Wilson and once again the majority of white people feeling like justice has been served. We can add to the list the failure to indict Officer Daniel Pantaleo in the chokehold death of Eric Garner. We can add the deaths of Trayvon Martin, the death of 12 year old Tamir Rice who was shot 2 seconds after the officer emerged from his car, and the countless others. Every 28 hours an African American is shot by the police, vigilantes or security persons, some are armed, some are thought to be armed and many are unarmed. In these cases the person in authority is acting in the role of jury and judge with no defense to be mounted. In these cases the person in authority is believed and the victim is to blame. Finally on World AIDS day, Dec. 1, the words finally came. Silence = Death was the slogan used by ActUp and others to demand attention to the AIDS epidemic that was killing gay men. I have seen signs now around the internet with White Silence = White Consent. Yes it is true, we as whites have been silent - liberal, conservative, independent, we have all been silent. We have been silent because we don't know what to say or we just believe that if there has been an investigation or a trial or something official then there must be something we don't know, we can't know and so we must trust our authority figures and move on. Sad yes, tragic yes, but we can't do anything about it. They should have done better, known better, did what they were told, not been in that place, it was just bad timing, he feared for his life. Our silence or our words that somehow the person shot could have/should have done something different are quite literally killing people. I cannot look at a young African American boy and not think when will you stop being cute and adorable and be seen instead as a threat, as a thug, as an object of fear. How soon will your parent(s) have to sit you down and tell you that the police can often not be trusted, how you have to be careful. Living in a middle class neighborhood won't protect you - look at Trayvon Martin. Education, money, fame and status will not fully protect you from the assumption that you are a criminal, a thug seeking to harm white people. My heart aches for those parents that will have to teach their children that no the police will not always help and may very well hurt. My heart aches for those parents who send their children out the door with the prayer that nothing bad will happen. I have heard it from my own family the words of white privilege. The Civil Rights movement was 50 years ago - we are not that way anymore. We have to wait for the investigation to be completed then we will know the truth. We can't know what happened because we are not cops or security or trained in the use of a gun. The most common phrase - there must be something we don't know because the police would not just have killed him. The truth of the matter is that any time a white person says "I felt afraid, I thought he would hurt me" it is nearly automatic that we believe the white person regardless of the facts and then anything that happens from there is the fault of the black person. Darren Wilson can claim that he looked at him with rage that he had never seen before and we as white people believe him. Probably Darren Wilson is telling the truth of his perception. I have no doubt that Darren Wilson was afraid and that Daniel Pantello was afraid, that George Zimmerman was afraid. We never ask the question, was the fear justified in such a way that taking of a life was justified. Once a white person says "I was afraid" that is the end of it. I am a white, queer woman of faith with an advanced degree. My white skin gives me privilege, privilege that I do not have to examine. Our society will let me walk right through never questioning the white world I live in. That is privilege - I don't have to think about race. I have to think about other things like being a woman in a world dominated by male privilege, being queer in a world dominated by heteronormative privilege but I do not have to think about race. I can choose to be silent. Yet I will not be. I will not be because it is not about the details of each of these deaths it is about the fact that it is ok with us that black lives still matter less. Latino lives matter less. Asian lives matter less. We cannot look at these deaths without also looking at the countless deaths of black men since the first ones were forcibly brought to these shores 400 years ago. How many were lost in the abduction of Africans? How many lost in the sea voyage? How they were enslaved, beaten and killed? How many had their children ripped from their arms and sold to others? How many were lynched? How many died and how many white people were held accountable for those deaths? This is not new, this is very very old and we don't want to acknowledge that. We as white people want to pat ourselves on the back for what a good job we have done. We can't say somehow that the killing stopped and then started back up again. The killing has never stopped. It has gone underground. It is draped in different stories now. Now we say well it was justified, he had no other choice, if he just hadn't been walking there, stole cigarettes, sold cigarettes, if he had not had a toy gun, if he had done as the officer said - just obey and then nothing bad will happen. That is simply not true. It is simply not true. In this season where we celebrate the Prince of Peace, the miracle of a lamp burning 8 days instead of 1, of the return of the light, we as white people need to stop and listen, then we need to speak. We need to say "no more" "I believe you" "Black Lives Matter" and "Each of us is holy, each of us is a manifestation of the divine" and we must mean it. We must listen, until our hearts are broken open to the reality that our silence, our complicity is killing people. My prayer in this season of darkness and light, is that we as white people will allow our hearts to be broken open. Yes it will hurt and it will not be comfortable. We will not like it. We must let the Spirit of life and truth, the Holy Spirit if you will, transform us, break us open, and then we must speak. We must speak up and not wallow in guilt. We speak to add our voices, to join our voices in a chorus demanding change, demanding peace, demanding an end to the killings. In this season where Christians celebrate the birth of the Prince of Peace we must join our voices to others calling for peace for people of color. In this season of the miracle of the light and the overthrowing of oppressors, may we add our light, our energy to work for a world where all lives truly do matter. As we await the return of the light and the rebirth of the earth, may we see a rebirth of humanity - replacing fear with love. That is my prayer for this season!